My first cannon was the Hern Iron Works, English Swivel gun purchased in about 2010. I expected complications in the ordering process. Instead, it was a simple transaction involving a signed and notarized cannon order agreement, a letter telling Hern what I wanted and a money order for the amount. The folks at Hern made the business really easy. It arrived in a little wooden crate about 30 days after I ordered it. Had to help the UPS guy carry it to the porch (I don’t think he was expecting a package that size to be quite that heavy). Upon opening the crate I found a pretty little barrel (rough iron) about 31 inches long. I found the steel barrel liner to be ¼ inch thick. When I checked for the touch-hole location, I found that Hern had provided a dimple exactly where the hole goes. I chose to mount the barrel on a small colonial field carriage. A choice I am very happy with. I have fired this piece extensively at organized events and have found it to be very strong and easy to handle. I will consistently repeat shots with a reasonable grouping out to 150 yards. As a first cannon (or second, or third…. ), I highly recommend this piece. 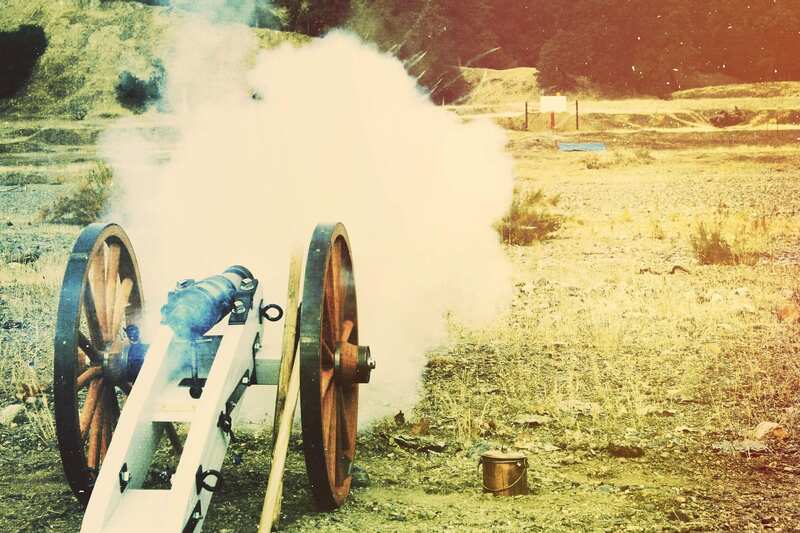 It is a great way to find out if you want to be a cannoneer without a huge financial outlay. The quality is excellent. I also have to say something about the customer service at Hern. I made tons of calls both before and after the purchase with all sorts of questions. I had never built a cannon before and needed lots of information. They were very patient and understanding (didn’t laugh at me) and directed me to locations for any parts I needed and made suggestions based on the experience of other customers. Hern has a loyal customer in me. I’ve included a photo of the gun mounted on the field carriage. As was the tradition, I named this piece Tempesta (little storm).